Long Term Evolution (LTE) is the so called 4th Generation (4G) mobile standard in the rapidly evolving mobile technologies. Its distinguishing feature is an all IP infrastructure and significantly greater air interface bandwidth to the mobile handset. It was developed as an enhancement to the existing 3G UMTS System (Universal Mobile Telecommunications System) to provide users enhanced mobile radio and internet access. The LTE air interface is a completely new system based on orthogonal frequency-division multiple access (OFDMA) in the downlink and single-carrier frequency-division multiple access (SC-FDMA) in the uplink. The system efficiently supports multi-antenna technologies (MIMO). Another significant feature of LTE is its high bandwidth—up to 20 MHz. The LTE can also operate in the existing 5-MHz UMTS frequency bands, or in even smaller bands, as the usable bandwidth is scalable. However, deploying high-quality voice, video, and data services over LTE has posed significant challenges for service providers, due to backward-compatibility, inter-operability, and high quality requirements – all of which requires rigorous testing. GL’s provides fully automated testing solutions for LTE, VoLTE, and IMS network as discussed in greater detail below. End-to-end voice, video, and data quality testing with speech metrics such as PESQ, and POLQA. This solution combined with other metrics such as delay, packet loss, drops, and more, the true performance of VoLTE can be realized. 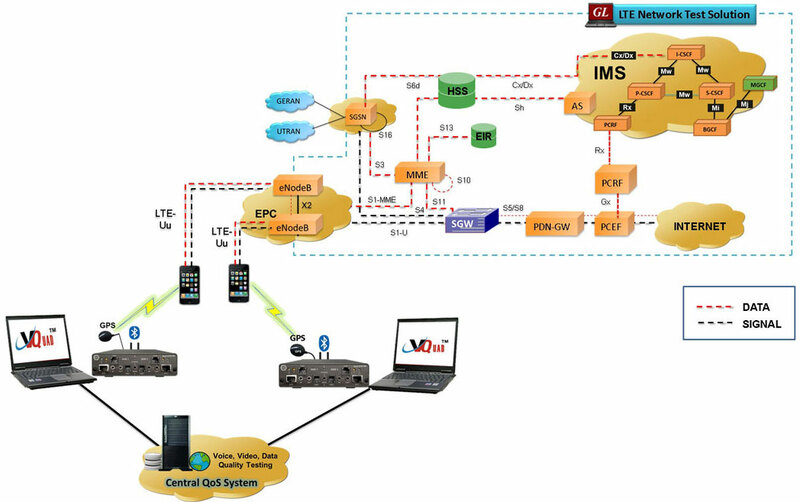 All elements within LTE-IMS wireless infrastructure can be tested with GL’s general-purpose protocol simulation tool - MAPS™, which supports simulation of various interfaces of LTE (S1-u, S1-MME, X2, S3, S4, S5/S8, S6a, S10, S11, S13, S16) and IMS (Cx/Dx, Rx, Gx, Gm, SGi, Mw, Mi, Mj) interfaces using MAPS™ LTE, Diameter, and IMS simulators. With these, one can simulate VoLTE calls in lab, and study the network behaviour. GL's PacketScan™ - an All-IP Network Monitoringsoftware offers powerful features to capture and monitor live signaling and traffic over IP. PacketScan™with Video QoS capability addresses customers long felt need of Video Call Quality Analysis in IP networks. Support for wide-range of codec, including AMR and AMR WB – visit Voice Codec webpage for more details. Trace files for analysis can be loaded through simple command-line arguments. 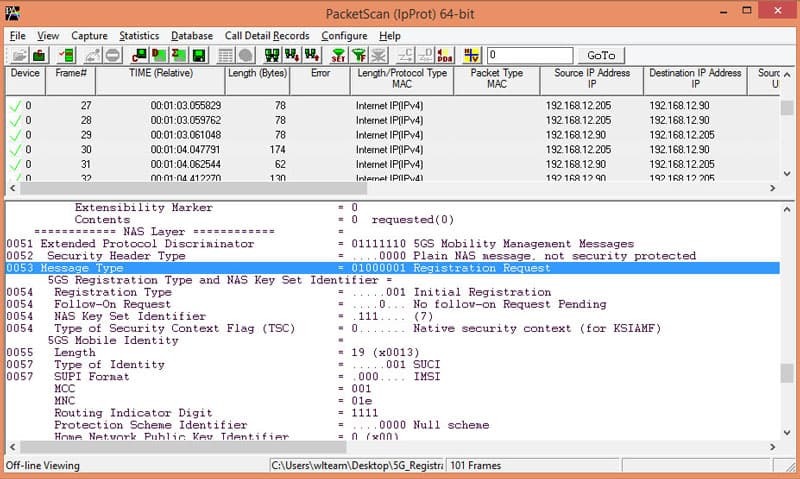 Visit PacketScan™ for Wireless Networks or LTE Analyzer webpage for more details. For centralized web-based monitoring LTE Network, visit NetSurveyorWeb™ page. Using GL’s VQuad™ with the Dual UTA HD, or all-in-one VQuad™ Probe, along with centralized analytical tools, voice, data, as well as video quality can be tested simultaneously on a wireless or wired network. Since the GL’s VQuad™ solution is network independent, all Voice and Data networks are supported including 3G, WiMax, 4G LTE, Advanced LTE and the upcoming 5G. And since the GL VQuad™ solution supports both Narrowband and Wideband traffic, VoLTE testing is fully supported. GL’s VQuad™ NetTestsolution provides automated data testing on Mobile Devices (Android and Apple) as well as PC based internet connections. The Data Testing includes TCP, UDP, HTTP, FTP, DNS, VoIP, SMS, and Email tests. GL’s Video Application Part (VAC) supports Video Conference testing between any two VAC Agents. GL’s VAC Agents can be installed on any Android device, WinPCs or Linux box. GL’s Voice Quality Testing (VQT) supports automated voice quality between any two nodes within the network using latest ITU based algorithms including Perceptual Objective Listening Quality - POLQA (ITU-P.863) and PESQ (ITU-P.862). The POLQA algorithm is specifically used for testing Wideband voice over VoLTE networks. VQuad™ can remotely perform Automated Data Testing on any Android or IOS mobile devices (running the GL NetTest app), irrespective of where the phone is located, and whether the phone is on a voice call or not. Visit Complete Voice and Data Quality webpage for more details. Visit voice quality testing webpage for more details. 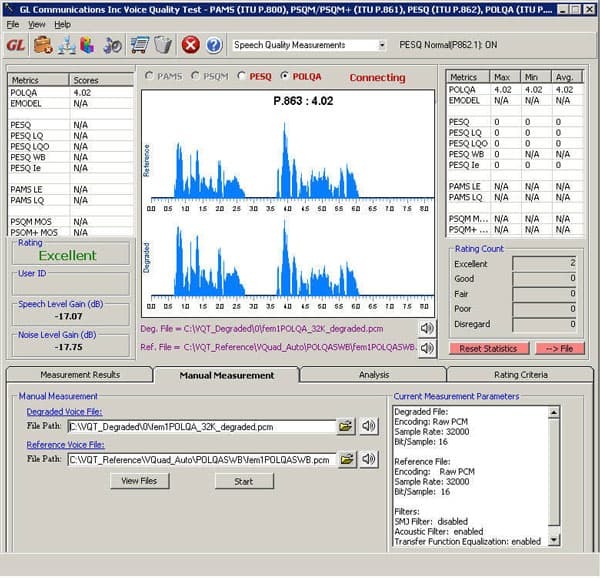 MAPS™ SIP IMS test suite is capable of simulating multiple UEs and IMS core elements such as P-CSCF, I-CSCF, S-CSCF, PCRF, MGCF which provides the IMS core network. With the help of mobile phones, and other simulated wireless networks, the VoLTE Lab setup can be operated in real-time for making VoLTE calls and also for interworking with PSTN and VoIP networks. It includes ready-to-use scripts, as per IETF specification. Test scripts include general messaging and call flow scenarios for multimedia call session setup and control over IP networks. GL’s “MAPS™ 4G Wireless Lab Suite” supports simulation of S1-MME, S11, S5/S8, and other eGTP interfaces along with Diameter interfaces.